About: Specializing in North Indian cooking, fresh and made to order with generous serving sizes. 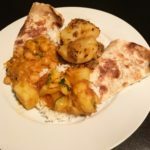 Vegan Grand Rapids Review: It’s the best Indian we’ve had in Grand Rapids. The food is flavorful, plentiful and the prices are right!